As its President, he built the Goetz Broadcasting Corporation from a single station, KMAQ, Maquoketa, Iowa, in 1956-58 to 12 stations in 1990 in Wisconsin, Illinois and Michigan, including WFAW-WSJY, Fort Atkinson, WDLB-WLJY, Marshfield, WRDB-WNFM, Reedsburg, WQJY-FM, La Crosse. 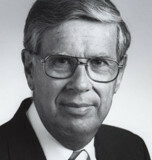 He served his industry as Treasure of the Wisconsin Broadcasters Association from 1968-86, guiding its financial fortunes under 16 Presidents and 3 Executive Directors during his tenure. Nathan Goetz passed away on Nov. 28, 2018. It is with great sadness that I learned of Nate’s death. I am so grateful that I could serve for 21 years with Goetz Broadcasting, when Nate believed in me and offered a world of opportunity. Through his leadership, I not only had the privilege of covering news in central Wisconsin — his networks gave me the honor of covering three Super Bowls (including both Packer ones in the 1990s), the 2002 MLB All-Star Game in Milwaukee, area visits from former Presidents George H.W. Bush & Bill Clinton, and much more. His belief in industry service resulted in my own service with the WBA’s Broadcast News Council, the Wisconsin AP Broadcasters and the state’s Freedom of Information Council. And in 1980, I learned firsthand about his “hands on passion” for radio when he got his hands dirty while helping erect the 800-foot antenna near Milladore for Marshfield’s WLJY-FM. Frankly, I didn’t see him a lot — and I didn’t need to. He knew what I was doing, and he took the opportunity to show his appreciation every time he saw me.